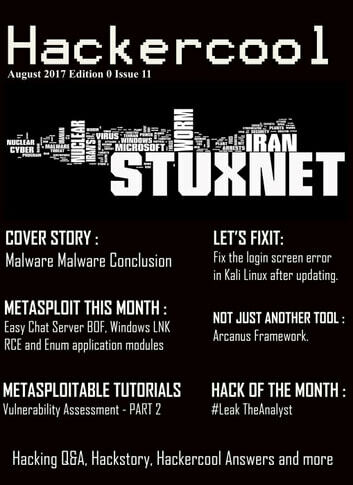 Here's what you will find in the Hackercool August 2017 Issue . Malware Malware (Conclusion) : Cover Story : Worms, Spyware, Keylogger, Logic Bomb, Bots,Rootkit and Ransomware. Installit : Installing Shellter in Kali Linux 2017.1. Let's Fixit: Fixing the login error in Kal lInux Rolling. Hack of The Month : 31337 #LeakTheAnalyst. Hackstory : The Mia Ash Persona. Hackercool Answers : Hackercool clears your ever persistent doubts in hacking. 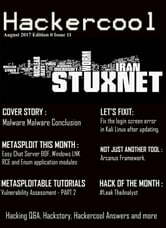 Metasploit This Month : Easy Chat Server Buffer OverFlow, Microsoft Windows LNK RCE and Enum application modules. Not Just Another Tool : Arcanus Framework- A tool to generate customized payloads for Windows and Linux. 10.Hacked - The Beginning : The First Interview - Part2.